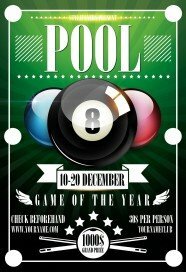 Billiard is a sport, which demand to be focused and concentrate, it’s one of the most popular sport all over the world. 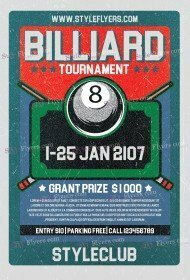 If you want to organize a billiard competition or championship, you can find an affordable and high quality Photoshop files for your event in our new premium Billiard flyers templates listing. 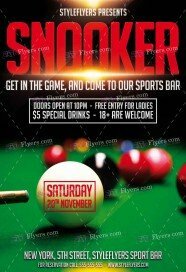 You can buy billiard flyer template and its Facebook cover, which you will use for online promotion, in this category at a fixed price $2.49. During the creation of printable samples, we try to convey the main idea and ambience of this event. You can be sure that all our premium flyers in this category have a unique design and well-organized structure and are available for sale. We care about clients’ interests, so we try to provide them with the high-quality products at a reasonable price. After buying, you are free to make any modification. Customization won’t take a lot of your time, because it’s easy to use. If you won’t make any changes by yourself, you can rely on our experts, they will do all they can satisfy all your requirements. 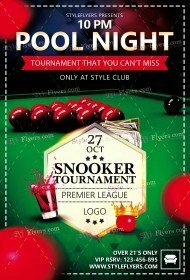 We understand that all people have different tastes and demands so we try to create different designs with varied styles. Watch our update to buy billiard flyer PSD templates first.